At 84 years old, Paul Resika reigns as the doyen of a particular school of modernist painting, one that presents luminous elements of the world in equally sumptuous colors and brushwork. Shaped in part by his youthful study with Hans Hofmann, Resika seizes his motifs —most notably, the harbor scenes and sailboats he has painted for several decades—as evocative structures of hue, texture, and light. This approach to pictorial structure animates two current show of his work. 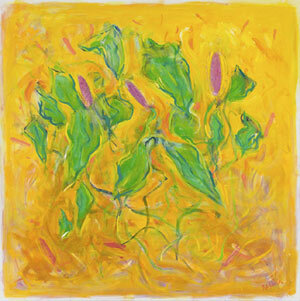 At Lori Bookstein Fine Art, eight canvases painted in the last two years summarize where he is now in his long career. Produced in conjunction, a “micro-retrospective” at Steven Harvey Fine Art Projects shows where the artist has been. One expects the joyful color of his recent work at Lori Bookstein, but not his conscious, ranging experimentations with pictorial space. Several canvases appear to revisit one aspect of Abstract-Expressionism, derived less from Hofmann than from Pollock or Rothko: an enveloping, non-hierarchical, “all-over” space. Inspired by rowboat-excursions on a Cape Cod pond, several canvases feature fields of jostling, notched circles; the continuous overlapping of these lily-pad shapes in the nine-foot wide “Pond Galaxy” (2010) create a palpable, festive depth despite the lack of any perspectival space. In “Pond #1” (2010) circles and lozenges suggesting fish swarm in a kind of delicious microbial broth. Other paintings, though, pursue different spatial strategies. By the simple expedient of placing lily pads in perspective, turning their circles into receding ovals, Resika imparts a deep space to paintings like “Interior” (2011)—though in terms of naturalism, Resika takes away with the other hand; a school of fish/lozenges hangs in the “sky” above. “Bright Night” (2010) combines several structural tactics; he mixes flattened triangles (from his lyrical flirtation with Cubism in the last decade) with the curling-fish-in-the-depths motif (from some of the weighty harbor paintings of the 80s) and the foreshortened disks of his most recent investigations. And then there’s “Dancing” (2011-12), which relies solely on color to create a throbbing depth, with leaf-like green forms and pink lozenges shimmering before a yellow-orange background. Expansive in its drawing and vibrant in color, it glows from within. At Steven Harvey, eight paintings deftly sum up eight decades of Resika’s remarkable career. (Four additional smaller paintings round out the show.) The elegant installation in the gallery’s small space makes the journey—from the brushy, angular abstraction in the 50s, through the lyrical representation of his mid-career, to the radiant, abstracted austerity of sail boat paintings from the last decade—not only lucid but spacious. Together the canvases suggest that the artist has in some respects come full circle, revisiting the pure abstraction of his early years. Newest to me was his earliest phase, represented here by “Composition, April ‘47”, a 1947 abstraction bristling with tough angles but a handsome palette of warm grays, subdued reds, and rich, earthy greens. Blunt yet poetic, the painting resonates as a strain of Ab-Ex that has become comfortable with, or at least habituated to, its own skin. The jewel-like “The Visitation” (1958), along with a self-portrait and landscapes from the following decades, reflect his early switch to representation, and especially the influence of Venetian and French School painting. 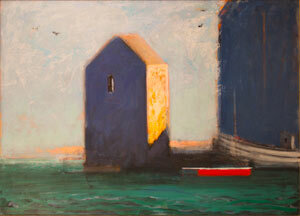 These works lead to the particularly vigorous “Provincetown Pier (Blue)” (1988), a five-foot wide canvas in which the natural drama of a wharf’s structures, illuminated by the late sun, are not simply observed but re-created with a momentous pacing of forms: a horizontal of deep emerald green for the sea, and sonorous blue verticals—one greenish, the other purplish—rising resolutely above the brilliant red sliver of a boat. The crystalline “Three Sails” (2009-2010) reflects Resika’s increasingly flattened and simplified forms in later years. Most recent of all is “Bill’s Pickerel” (2012), the loosest painting in the exhibition, with intensely green and red forms (once more distinctly fish-like) moving freely through a deep but indeterminate orange space. We’re back to the sheer exuberance of shapes and colors—though this is a place the artist, even as he has moved from complex descriptions to underlying essentials, never really left.